Our goal is to seek reasonable returns, control the downside risk, all of which is based on each client's comfort level. We believe risk and return are directly related, managing the two is essential for a family’s well-being. We believe in outcome-based portfolio construction-benchmarking client progress against their goals. We select broadly diversified portfolios that emphasize areas offering the potential for higher expected return. 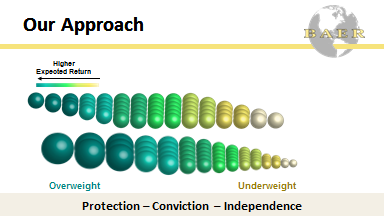 The strategies can emphasize securities with higher expected returns by overweighting them compared to their market cap weight. One way to visualize overweighting is to think about an ice cube tray with sections that are shallower and deeper. In a portfolio, each section holds many stocks that compose a market area, and those with greater return potential are over weighted, just like the large ice cubes. In a dimensions-based approach, capturing returns does not involve predicting which stocks, bonds, or market areas are going to outperform in the future. Rather, the goal is to hold well-diversified portfolios that emphasize dimensions of higher expected returns and have low turnover.